What I’d like to have right now is for all you high rolling, Atlantic City Sweathogs keep the noise down while I take my robe off and give the ladies a good look at the sexiest man alive. Here comes the Warrior! Shaking the ropes, head banging. He steps in the ring hits the far ropes, Rick Rude ducks the big clothesline and comes in to knee the Warrior in the stomach. Ouch! Warrior is still wearing the title! This right here is why I absolutely love Rick Rude as a performer. The way he sells how much pain he is in because of kneeing the Intercontinental Championship title. There are only a handful of wrestlers over the years who can sell like this. Now of course by this time the Warrior is gassed so he slowly manhandles Rude for the next 5 to 10 minutes with some boring bear hugs. Then enter some more classic Rude selling. He gets the Warrior down and now it’s time to get the ladies excited again, so he begins to shake his hips. But ouch! His back hurts too much to do it. As a kid I thought, “serves you right!”. The match continues back-and-forth for a while with the Warrior mostly in control. Rude starts to go for his finisher, the Rude Awakening, but Warrior breaks it up. The match spills to the outside of the ring. As the Warrior maintains control and begins to suplex Rude back into the ring. This is when the unthinkable happened. Rude’s manager, “The Brain”, grabs the Ultimate Warrior’s leg as he suplexes Rude causing him to lose his balance and Rude ends up on top. Heenan continues holding the Warrior’s leg while the referee counts: one, two, three. I screamed and screamed at the TV. This cannot be. The Ultimate Warrior is invincible! How could the referee not see The Weasel, I mean, Bobby “The Brain” Heenan holding the Warrior’s foot?!? 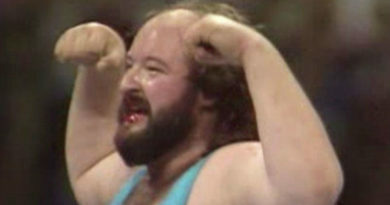 In the 80s, I don’t recall a lot of matches where the bad guy got beat up for most of the match. But, because the ravishing one was so great at selling the moves, almost his entire feud was dominated by the Ultimate Warrior. 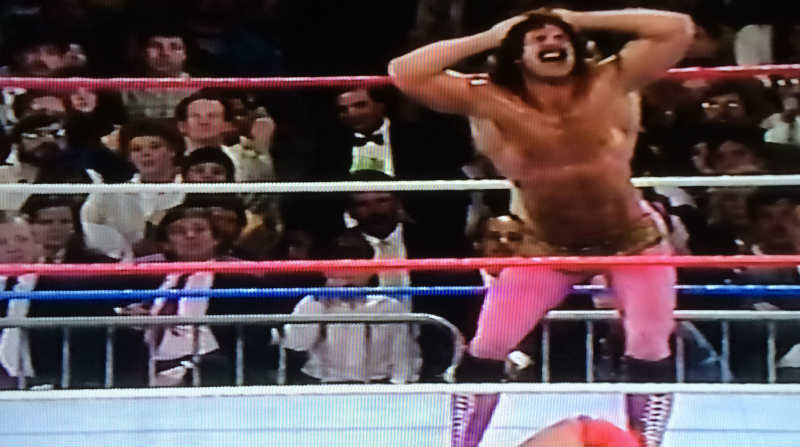 I mean, seriously, how classic are Rick Rude’s expressions? Once again, the WWF nailed it. I mean, sure the Warrior lost, but he was cheated. This of course was the perfect setup to carry their feud even longer. 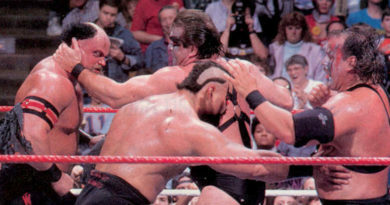 Who was not going to watch the 1989 Summerslam rematch? Of course The Ultimate Warrior won back his Intercontinental Title, but he did it with help and distractions. Once again, another great way for the match to end. The fans didn’t feel cheated, they got what they wanted, and more importantly, because it wasn’t a “clean” win, it allowed for a potential future rematch. Share with me your favorite Rick Rude moment using the comment form below.